"Mafia (game)" redirects here. For the video game, see Mafia (video game). Mafia, also known as Werewolf, is a party game created by Dmitry Davidoff in 1986 modelling a conflict between two groups: an informed minority (the mafia), and an uninformed majority (the innocents). At the start of the game, each player is secretly assigned a role affiliated with one of these teams. The game has two alternating phases: one, during which the mafia may covertly "murder" an innocent, and two, in which surviving players debate the identities of the mafia and vote to eliminate a suspect. The game continues until all of the mafia have been eliminated or until the mafia outnumber the innocents. Dmitry Davidoff (Russian: Дми́трий Давы́дов, Dmitry Davydov) is generally acknowledged as the game's creator. He dates the first game to spring 1987 at the Psychology Department of Moscow State University, spreading to classrooms, dorms, and summer camps of Moscow University. [Note 1] Wired attributes the creation to Davidoff but dates the first game to 1987, with 1986 being the year in which Davidoff was starting the work which would produce Mafia. He developed the game to combine psychology research with his duties teaching high school students. The game became popular in other Soviet colleges and schools and in the 1990s it began to be played in other parts of Europe and then the United States. By the mid 1990s a version of the game became a Latvian television series (with a parliamentary setting, and played by Latvian celebrities). Andrew Plotkin gave the rules a werewolf theme in 1997, arguing that the mafia were not that big of a cultural reference, and that the werewolf concept fit the idea of a hidden enemy who looked normal during the daytime. Mafia and a variant called Thing[Note 2] have been played at science fiction writers' workshops since 1998, and have become an integral part of the annual Clarion and Viable Paradise workshops. The Werewolf variant of Mafia became widespread at major tech events, including the Game Developers Conference, ETech, Foo Camps, and South By Southwest. In 1998 the Kaliningrad Higher school of the Internal Affairs Ministry published the methodical textbook Nonverbal communications. Developing role-playing games 'Mafia' and 'Murderer' for a course on Visual psychodiagnostics, to teach various methods of reading body language and nonverbal signals. In September 1998 Mafia was introduced to the Graduate College at Princeton University, where a number of variants were developed. The werewolf theme was also incorporated in the French adaption of Mafia, The Werewolves of Millers Hollow. In August 2000, a user under the alias "mithrandir" of The Grey Labyrinth, a website devoted to puzzles and puzzle solving, ran a game of mafia adapted for play on a forum board. Both The Grey Labyrinth and sister site MafiaScum claim that this was the first game of mafia run on a forum board. From there, Mafia has spread to numerous online communities. In June 2006 a Rockingham school inquiry was launched after parents complained of the traumatic effects classroom Mafia was having on their fifth-grade children. Davidoff responded to the reports, saying that as a parent who had studied child psychology for 25 years, he felt that the game could "teach kids to distinguish right from wrong", and that the positive message of being honest could overcome the negative effects of an "evil narrator" moderating the game as if it were a scary story. Mafia was called one of the 50 most historically and culturally significant games published since 1890 by about.com. In its simplest form, Mafia is played by two teams: the mafia and the innocents. Live games require a moderator who does not participate as a player, and identities are assigned by handing out cards. At the start of the game, every mafioso is given the identities of their teammates, whereas the innocents only receive the number of mafioso in the game, and do not know which players are mafia and which are innocents. There are two phases: night and day. At night, certain players secretly perform special actions; during day, players discuss and vote to "lynch", or eliminate, one player. These phases alternate with each other until all mafiosi have been eliminated or until the mafia outnumbers the innocents. Andrew Plotkin recommends having exactly two mafiosi, whereas the original Davidoff rules suggest a third of the players (rounding to the nearest whole number) be mafiosi. Davidoff's original game does not include roles with special abilities. In his rules for "Werewolf", Plotkin recommends that the first phase be day and that there be an odd number of players. These specifications prevent players from being killed before the first day and in most scenarios ensure that the game will end dramatically on a lynching rather than with an anticlimactic murder. All players close their eyes. The moderator then instructs all members of the mafia to open their eyes and acknowledge their accomplices. The mafia members pick a "victim" by silently gesturing to indicate their target and to show unanimity then close their eyes again. A similar process occurs for other roles with nightly actions. In the case of the detective, the moderator may indicate the target's innocence or guilt by using gestures such as nodding or head shaking. Night may be accompanied by players tapping gently to mask sounds made by gesturing. The moderator instructs players to open their eyes and announces who "died" the previous night. Discussion ensues among the living players. At any point, a player may accuse someone of being a mafioso and prompt others to vote to lynch them. If over half of the players do so, the accused person is eliminated and night begins. Otherwise, the phase continues until a lynching occurs. According to some rules, the role of dead players are revealed; according to others, it is not. In both cases, dead players are not permitted to attempt to influence the remainder of the game. Because players have more freedom to deliberate, days tend to be longer than nights. Mafia is a complicated game to model, so most analyses of optimal play have assumed both (a) that there are only townsfolk and mafiosi and (b) that the townsfolk never have a probability of identifying the Mafia that is better than chance. Early treatment of the game concentrated on simulation, while more recent studies have tried to derive closed-form equilibrium solutions for perfect play. (equality in the limit of the infinite number of players). If you're trying to feign shock or anger, it's much harder to do over a long period. People accused of something they're trying to hide will start out feigning outrage – 'How dare you ask me that?' But that will start to change to objection rather than shock, as it's psychologically very difficult to mimic emotion. The information revealed by the mafiosi voting patterns tells against them later in the game. One of the game's fans Max Ventilla, has said that "If the villagers are allowed to keep a pencil and paper, they always win." As players get more experienced, their strategic sophistication and ability to spot and use deception increases. They will typically get better at the skills needed for playing innocents faster, being villagers more often than mafiosi. The Metagame aspect: Dimma Davidoff has said past connections will always lose to future collaborations. When playing several Mafia games with the same people, it's more helpful to be known for honesty than for deceit. Davidoff considers that so important that he thinks the advantages of playing the mafioso role honestly, outweigh the disadvantages. But, the Mafia can win in live play; their best chance of winning occurs when mafioso bond with their innocent neighbours and convince those neighbours to value that bond over dispassionate analysis. The game designers Salen and Zimmerman have written that the deep emergent social game play in Mafia (combined with the fear of elimination) create ideal conditions for this. These additional roles are named differently in the many versions of Mafia, for thematic flavor, or historical reasons. Also, the same role-name can have differing functions across different versions of the game. What follows is a general list of role types found in Mafia variants; since the specific names vary by milieu it must be non-exhaustive. Players with these roles use their own night-phase to discover something about other players. Though the standard game now includes the basic Detective, these roles are optional, and games can exclude them entirely (such as the stool pigeon variant, or Davidoff's original rules). —Detective, Seer, Commandant, Sheriff, etc. Allied with the Innocents, the Detective can detect whether a player is a mafioso. They will typically wake up, and point at one person; the Narrator will silently indicate to the Detective whether that player is Mafia or Innocent. In some versions of the game, the Detective's investigation result is announced publicly by the Narrator, for example the Detective found a Mafioso!. More commonly, no announcement is made. As with other roles, which player is the detective is not generally known, leaving anyone the option of pretending to be the Detective. A Detective is usually included in modern games. For example, somebody is always assigned this role in all commercial card game versions,[Note 4] and almost all internet-based, and most face-to-face games start with at least one detective. [Note 5] Multiple detectives either act in separate night phases (unaware of the identities of other detectives) or work together as the police (an association role). —Psychic, Wizard, Fortune Teller, Oracle, Tracker, Watcher, etc. Psychic, Psychologist, or Sorcerer-type investigators can determine other players' roles, rather than their alignments. Roles which detect other roles are usually implemented in the same way as the Detective's ability to determine alignment. For example: the Psychologist points to a player (at night) for a Thumbs-up from the moderator if the Vigilante is pointed to. [Note 6] A Tracker may see what someone's night action was, or the target of their action, while a Watcher may see all those who visited someone at night. In some games, there are Mafia Detectives, who have the power of a normal detective but are on the Mafia side. The Super Commandant has the standard power of a Detective, while also protecting the investigated from night-time attack. —Witness, Child, Little Girl, etc. Instead of having to investigate, some innocent roles give complete information on the entire mafia: The witness is told who the mafia are during the first night, while the mafia are not told the witness's identity (differing from the stool pigeon in not being a part of the mafia). —Guardian Angel, Doctor, Bodyguard, Hero, Jailer, etc. —Vigilante, Veteran, Hunter, Bomb, Woodcutter, etc. —Miller, Godfather, Alpha Wolf, Wildcard, etc. Some roles can fool investigations to determine their alignments: the Miller is an Innocent who appears guilty (usually because they are an outsider); the Godfather, on the other hand, appears innocent despite being the Mafia leader. [Note 15] The Alpha Wolf or Master Werewolf have the same role as the Godfather in Werewolf settings. —Traitor, Possessed, Undercover Cop, Godfather, etc. The Traitor is not a mafioso (in that he does not awake at night and is not revealed as a mafioso by Detective type roles), but works to protect them and hamper the town during the day cycle, and wins only with a Mafia victory. Conversely, the Undercover Cop is a mole within the Mafia group who acts with the Mafia but wins with the innocents. The stool pigeon may be the only optional role in play, and makes up one of the few modern game forms to be played without an investigative role. Distinct from the alignment-role Godfather, the double-agent Godfather behaves as a standard mafioso, but wakes again (after the Mafia sleep) to perform an extra kill. This Godfather-role wins only if he survives. —Role-blocker, Bus Driver, Thief, Barman, Witch, etc. When the thief is used in Werewolves, an additional townsfolk card is added before dealing, and the Thief may choose on the first night to steal the role of another player or to take the unused role card. The player whose role was stolen gets the unused role card and the Thief card is discarded. —Godfather, Psychiatrist, Piper, Cult Leader, etc. Each night, the scientist selects a player to cure; if a mafioso is cured, they awaken as an innocent. The Psychiatrist is an innocent with the ability to convert the Serial Killer into a normal innocent. Cult Leaders recruit followers at night instead of kill; they act as an independent faction, usually with the ability to talk at night. The Piper wins by charming every surviving player; she charms players at night, who then know each other (but not the piper) but are otherwise unaffected. —Freemasons (Masons), Siblings, Lovers, Police, etc. Possessors of these roles know one another and what their roles are. On the innocent's side, a Mason usually has no special abilities, but knows the identity of all other Masons and that all Masons are also innocent. Every member of the detectives or the police knows all the rest, because they collaborate at night to investigate someone (sharing the powers of the Detective role between them). Sibling pairs typically consist of one Mafia and one Innocent; in most versions, if one is killed, the other also dies.Cupid in Werewolves chooses a pair of Lovers on the first night. In this variant, the Lovers can also win the game (regardless of whether they are Mafia, Innocents, or both) by being the last two standing. —Doublevoter, Priest, Rabble Rouser, Lawyer, etc. Until the Rabble Rouser dies there are two lynchings per day. In some games there are players who can change the vote count. Some players have 2 votes (Doublevoter); some players can only cast the final vote to kill a player (Actor); cannot vote to lynch (Voteless Innocent); must delegate someone else to vote for them (Fool), or require one fewer vote to lynch (Hated Innocent). The Priest cannot place the final vote (this role is not necessarily the same as the Reanimation-role priest). The lawyer selects someone during the night, and if that person tops the lynching vote the next day, saves them (a different lawyer role releases the wills written by players killed up to that point, when she dies). —Mayor, Judge, Sheriff, President, etc. This role is taken in addition to the assigned role, and it endows the player with additional, overt, powers (particularly during the daytime). Empowerment can be random, but is usually made by vote. For instance, the Mayor or Sheriff can be elected each morning, and gain two lynching votes, or a Judge could moderate discussion in parliamentary fashion (to the advantage of their team). The elected President has the sole lynching vote. In Town of Salem, a version of Mafia, the Sheriff is a role which can interrogate people at night, and get to know their role. The Godfather and the Arsonist are immune to the detection of a Sheriff, and the Framer can frame a player to make them appear as a mafioso. —Murr, Drunk, Village Idiot, Teenage Werewolf, etc. This may be a secondary role, taken in addition to the assigned role. However, it has the opposite effect, giving the bearer a handicap, like speaking only gibberish in the case of the Village Drunk, etc. Alternatively, it may be a standard role with a particular constraint, such as the teenage werewolf, who must say the word werewolf at least once each day. —Silencer, Dentist, Prostitute, Fog, etc. The Dentist may select any other player at night, and prevent them speaking during the following day. The Silencer is a mafioso with the identical power, except that they may not silence the same player on successive days. The silenced individual wakes in the morning and is immediately instructed not to talk until the end of the day. They can still raise their hand to vote in live games (although, if they were silenced by a prostitute, they are not allowed to vote). —Dark Background, Priest, Medium, Coroner, etc. The dark background roles are standard (mafia or innocent) except for revealing a deceptive alignment when killed. The M.E. gathers information from the killings that can help the innocents, while the Priest learns about the alignment of the dead in the same way that the Detective learns about the living. The Medium can interrogate dead players. [Note 18] While the coroner survives, the narrator will explain the means of death in all night kills. —Reviver, Governor, Martyr, Witch, etc. The Bulletproof innocent is invulnerable at night,[Note 20] though usually with limits; for example, the Elder will survive the first night attack, but not the second. The Oracle has an investigative role similar to a Seer but also has the power to talk when inactive (talking in a sleep phase is usually a rule infraction). —Baker, Chef, Village Idiot, Cobbler, etc. The baker is on the side of the innocents. During the night, the baker gives one player a loaf of bread, potentially revealing their identity. If the baker dies, the innocents have just three nights to dispose of the mafia, or the innocents starve, and the mafia win. The Cobbler, Village Idiot, or Jester has the objective of convincing the town to kill them, or is required to vote in favor of all proposed lynchings. Sometimes, successful lynching of the Village Idiot results in the mafia being able to kill two people that night. Additional variations exist, sometimes with even more specialized or complicated abilities. There are many special roles, and many moderators design novel roles for each game. Some commercial variants ship with blank cards to allow this customization. The naming of various roles, factions, and other elements of play is theme-dependent and has limitless variation. Common alternative themes restyle the mafia as werewolves, cultists, assassins, or witches, with other roles being renamed appropriately. Over the years, players have created Mafia variants that include additional rules. Some of these are listed here. If there are as many mafiosi as innocents in the day-phase then a mafia victory is declared immediately, under the original Mafia rules. Other variants suspend this rule, and only declare the game after every member of one faction has been eliminated: this makes the game easier to explain, and to run. Nominees for lynching may be allowed to make a speech in their own defense. Usually, each player must vote, can only vote once and cannot vote for themselves. But some variants have a more complicated process of selecting players to be executed. Davidoff's original 'Mafia' allowed multiple day-time executions (per day), each needing only a plurality to action. An option to lynch (or not lynch) one suspect (with a new suspect produced if the last one survives the vote). Deadlocked elections can be resolved by lot or by killing the player with the scapegoat special role. The special case of one mafioso and one innocent remaining can be decided randomly or be ruled a Mafia win—this is more usual in live play. The Innocents can choose not to kill anybody during the day. Although commonly unsure of Mafia identities, the Innocents are more likely to randomly kill a mafioso than are the Mafia (at night). Therefore, not lynching anyone (even at random) will typically favor the Mafia. However, when the number of survivors is even, No Kill may help the Innocents; for example, when three Innocents and one mafioso remain – generally called MYLO, or Mislynch and Lose due to the innocents' loss upon a lynch of their own – voting for No Lynch gives a 1/3 chance of killing the mafioso the next day, rather than a 1/4 chance today (assuming random lynching). By waking the Mafia members up separately. By calling out the names of all surviving players and requiring surviving mafiosi to raise their hands when the name of the victim is called out. In this variant, the mafiosi only "wake up" (open their eyes) at the very beginning of the game when they identify each other. This variant also allows other roles to take their actions by simply raising their hands when their target's name is called out. By having them write their kills. Under this variant, Innocent players write the word 'honest' on a piece of paper; Mafia members write the name of a player for elimination. If all the mafia notes have the same name on them, that player is considered killed by the Mafia. In some online versions of the game, a particular player (the Godfather or a designated mafioso) must send in the kill. 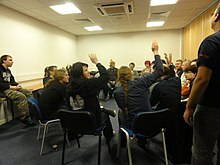 Multiple, independent groups of mafia or werewolves act and win independently, giving faster game-play and the potential for cross-fire between the factions. In this variant, players are given two cards: the first contains their role, the second an attribute. Attributes were originally derived from roles that could apply to both Mafia and Innocent alignments such as Bulletproof (cannot be killed at night), Mayor (has two votes in the lynch), and Siamese Twins (more commonly known as Siblings or Lovers). This variant was developed by Steven Irrgang and used for a puzzle in the 2008 CISRA Puzzle Competition. The difference from a standard game of Mafia is that players are not initially assigned roles, but rather on each day are given the probabilities describing the game's current quantum state. Each player with a non-zero probability of being a seer or a werewolf performs the appropriate night actions (which may not be effective if it is later determined that the player did not have that role). When a player is killed, the wave function collapses and the players are given updated probabilities. Traditional Mafia re-envisioned and heavily modified by the Copenhagen Game Collective to be played in a subway metro. In this variation, players who are 'lynched' are kicked off the train (at the next stop), and must wait in shame for the following train – a kind of 'afterlife' train – to join a second, interwoven game. A location-based mobile gaming variant for Android, designed for city center play. The two factions are: the Rebels, the majority; and the Spies, the informed minority. The rule-set replaces expulsions with scoring by round. Each player is assigned an individual mission each round. Some missions are critical and if one of those fails, the round goes to the Spies, but only one player knows which missions are critical. This is an advanced version of Mafia that takes place during the Salem witch trials. It involves several different roles from multiple factions. Every single player is assigned a role. There are no "innocents" (people who have no special role but are aligned with the Town). Besides the Mafia and the Town, there is also a separate, "neutral" faction whose roles are usually not aligned with either faction and have their own goals. For example, the Executioner needs to get someone lynched during the day, the Jester's goal is to be hanged during the day (must convince the town they are an evil role), the Survivor must simply stay alive until the end of the game, and the Arsonist must be the last person standing . The game was recently updated to add a new faction: the Coven, which mainly consists of witches and is similar in function and goal to the more traditional Mafia. Mafia can also be played online. Games can be played on IRC channels, where a bot assumes the role of a game moderator and the interaction of players is conducted via textual communication. Being that IRC is not a widespread way of communication, these Mafia games are restricted to limited number of people. Since 2008, many other Mafia game sites were formed. These sites are attempts at reproducing the live Mafia games, and the duration and the mechanics of the games are about the same as when the game is played traditionally. Playing mafia-like games online opens the possibility of long lasting games, such as the ones on forums. In such games, one day in real life usually corresponds to one day within the game, so players log in each morning to see who was killed during the night phase. The online games have several advantages. There is no need to gather many people in the same room, so organizing and playing a game of Mafia is faster and more convenient. Removing the human moderator and the need for players to close their eyes removes the possibility of accidental revelation of information. Online play also allows role mechanics which would be too cumbersome to use in a physical version of the game. A drawback of online play is the lack of direct face-to-face communication, which many consider the most important aspect of Mafia. Some sites organize Mafia games with web cams, so that face-to-face communication is preserved. The long lasting online mafia games that are usually played via online forums do not necessarily have this drawback. People who communicate via forums usually do not know each other in real life. In a traditional Mafia game, all of the players are in one room. There is no way to communicate with another player in private. With online games, this is not the case. Many Mafia game forums and game sites have rules that mandate that only one channel of communication must be used for all game related discussion. Thus forbidding the use of alternative channels for discussing the game. These rules are obviously only declarative as there is no way of enforcing them efficiently. It is especially difficult to enforce such rules during long games with players who communicate with each other in person in real life. All forums support different kind of game setups, so it is feasible to organize a forum game without the restrictions on private messaging. A particular problem for these rules is trying to prevent "dead" players from participating in the game. Since, in general case, this breach of rules cannot be proven, the gameplay of most sites depends heavily on players' honesty and integrity. ^ Plotkin quotes a 2005 email in which Davidoff explains that he brought Mafia into the Psychology department classrooms for research and it spread (as a meme) from there to dormitories and likely over next summer, through student summer camps. He credits this game-based methodology to pioneering 1920s psychologist Lev Vygotskiy. ^ In which the antagonists are Things, shape-shifting aliens that can turn humans into other Things. For the rules of the original variant, see: "Thing Werewolf Variant". . For a detailed description of another variant of this game, see: Solis, Daniel. "Alien Among Us". . For the most recent variant using web-enabled devices, see: "Latitude 90: The Origin". ^ The single detective publishes a large list of innocents, and asks to be lynched to guarantee its veracity (under the standard rules in which the detective's role is revealed after she is killed, no strategic interference from the Mafia is possible): Braverman, M.; Etesami, O.; Mossel, E. (2008). "Mafia: A Theoretical Study of Players and Coalitions in a Partial Information Environment". Annals of Applied Probability. 18 (3): 12. arXiv:math/0609534. Bibcode:2006math......9534B. doi:10.1214/07-aap456. ^ For example, "The Mafia rules (MIT)". , from Massachusetts Institute of Technology, are very simple, and specify roles for 7–20 players, always including at least one Detective. Andrew Plotkin's original Werewolf always includes a Villager (Seer), and he mentions that in 1997 Mafia was played in the National Puzzlers' League convention with a Knight Commandant. (The role of the Knight Commandant or Knight is described in detail as having the standard Detective powers in: "National Puzzlers' League – 1997 Convention Reports". Archived from the original on 2007-12-08. Retrieved 2007-11-24. ) Plotkin describes Davidoff's original game (which had no Detective) as well off the current average. A rare modern rule-set with No Inspector is: Engstrom, Vegard (1999). "The Game Player Constellations". Retrieved 2010-06-15. but only when starting with five, larger groups get at least one inspector. ^ For example, Vigilante in the "Princeton rules". ^ For example, The Oracle in Werewolf chooses one person to investigate every night, and are shown their card, unless they pick the Master Werewolf – when the Oracle is shown an (innocent) villager card. ^ Depending on the variant, they may know the identities of the Mafia, but this isn't required; they usually indicate the player to protect in a separate phase of gameplay (a separate part of the night) than the Mafia's killing phase. The Mafia-Doctor is a mafioso, and a more obscure variant role, with the opposite power (from the Doctor) of protecting the guilty from attack during the day. ^ The protected player gains complete invulnerability during the night they are visited by the Doctor or Bodyguard. The Mafia do not usually know the identity of the protected player, nor get a chance to select another victim, so this attack is wasted if the Mafia target a protected player (e.g., "Bodyguard, Lupus in Tabula". Archived from the original on 2005-12-24. Retrieved 2007-11-13. ). ^ For example, see the 2+2 rule-set describing the Nurse: "Mafia rules". ^ For example, the Witch in Werewolves of Miller's Hollow has only one use of her protective potion. She is allowed to see who was killed by the werewolves before applying the protective potion, so this character is more typical of the reanimation than the protective type. ^ "Do you worship Cthulu Roles and Quick Reference Script". Retrieved 2007-11-21. . This makes the vigilante as lethal as the entire Mafia, potentially overbalancing the game, which has led to the introduction of roles that limit his effectiveness, such as the Walrus role-blocker. ^ The Hunter appears in Werewolves of Miller's Hollow, for example. The Woodcutter is a (less common) equivalent name for the role. Wired recommends including the hunter in even the most basic games: "Original Werewolf characters". January 2010. Retrieved 2010-06-13. ^ The Godfather role is played differently between variants. If immunity to detection is the Godfather's only power, his leadership of the Mafia need only be nominal: "Name: Godfather". Archived from the original on 2007-02-27. ^ The thief's action usually applies for a single night, as in: "Mafia Game: IRC Version". Archived from the original on 2007-12-15. . The thief sometimes has a purely investigative function – being only able to determine the roles from stolen items. "Thief". Archived from the original on 2007-02-27. ^ Bennet, J. "Mafia: Advanced rules" (PDF). Archived from the original (PDF) on 2011-08-10. In other variants, the mafia can't kill anyone else on the night this power is used. The potential existence of a Yakuza makes innocents with protective roles less inclined to reveal their roles for fear of being converted (or more inclined to reveal themselves if they expect the Mafia to win and wish to be converted). ^ The Medium function varies, for example see summarized 'Medium-enabled seance' rules from Werewolf at: "boredgamegeeks". Retrieved 2007-11-14. , as opposed to the Lupus in Tabula Medium, who alone can uncover the alignment of the deceased (see: "Lupus in Tabula (English rules) Special Characters". ). ^ François Haffner (1999-02-22). "Questions to Dimitry Davidoff about the creation of Mafia on the French website". Jeuxsoc.fr. Retrieved 2011-04-11. ^ a b c d "Werewolf page History section". ^ a b c d e f g Robertson, Margaret (2010-02-04). "Werewolf: How a parlour game became a tech phenomenon". Wired UK. Conde Nast Publications (3.10). Retrieved 2010-06-06. ^ Danopoulos, C. P.; Zirker, D., eds. (December 1998). The Military and Society in the Former Eastern Bloc. Boulder: Westview Press. p. 175. ISBN 978-0-8133-3524-7. OCLC 237326581. The objective is to discover who these [Mafia] people are even as they speak on behalf of Latvia's welfare, and before they eliminate people who suspect who they are. ^ Kaufman, Jerry (2000-01-01). "Corflatch Progress Report #3". John Aegard is running another event, to take place Friday at 8 p.m. John says, Come play the game that's paralyzed two straight Clarions – MAFIA! Since the Clarion workshops take place during the summer, the game must have first been played at a Clarion workshop in 1998, most likely Clarion East – see David Levine's account of Clarion West 2000, "David Levine's Clarion Journal: Week 6". [permanent dead link] Mafia and Thing were first taught to the annual Viable Paradise workshop by James Patrick Kelly and Steven Gould in 2001; see Silverthorne, Lisa. "The VP Experience". ^ See "Making Light: Home Again". ; "Making Light: Traditional diversions". ; Azure, Chris. "Viable Paradise – Day 1". Archived from the original on 2011-08-17. ; Griffith, Eric. "A week in paradise". ; and Gordon, Barbara. "Viable Paradise, day one". . Quoting Dvorin, Julia. "Viable Paradise: A Travelogue (Part 1)". After the introductions and instructions for the next day, I thought that perhaps we'd be released and I could go see the room I was to be staying in for the week and chill out a little from the travel. But such was not to be, for the agenda now turned to the important bonding activity of playing Mafia and Thing. So I pushed away the cranky traveler's whininess that was stalking me, and sat down in a circle with a bunch of strangers and began to accuse them of lying and murder. Also: Gould, Steven. "Photo: semi-mandatory Mafia". ^ "The Graduate Mafia Brotherhood at Princeton University". Archived from the original on 2014-05-17. . Retrieved 2014-05-16. ^ "Mafia!!". The Grey Labyrinth. mithrandir. 20 August 2000. Retrieved 21 July 2016. ^ "Forum Index". The Grey Labyrinth. Retrieved 21 July 2016. The Internet's First Home of Mafia. ^ "History of the game". MafiaScum. 31 January 2007. Retrieved 21 July 2016. mith had been visiting [The Grey Labyrinth] since 1996, and started posting in the forums soon after they started. mith had played face-to-face Mafia with his church youth group in the late 1990's, and one day decided it would run well on the forums. The original thread can still be found here. ^ Berest, Pavlo (2006-03-08). "Intellectuals playing mafia games". Now the rules of the game are the intellectual property of Fedorov. The club has its own rules, see: "Club Империя Мафии". ^ Davis, Aaron (2006-08-04). "School officials still investigating 'Mafia'". Seacoast Media Group. One parent, Nicole Hollenbeck told The Rockingham News in June, My child has had sleepless nights, crying before bed because she's afraid that she'll sleep walk and relive the tragic events they talked about in class [...] We teach our kids right from wrong, and this is what they are being taught? ^ Arneson, Erik. "Board and Card Games Timeline". . About.com also includes Mafia in the Top 5 Best Voting Games. The reason it is significant is given: "Werewolf / Mafia". Archived from the original on 2007-11-03. Retrieved 2007-11-25. Werewolf is a favorite at game conventions and has been written about in several mainstream articles. ^ a b Braverman, M.; Etesami, O.; Mossel, E. (2008). "Mafia: A Theoretical Study of Players and Coalitions in a Partial Information Environment". Annals of Applied Probability. 18 (2): 825–846. arXiv:math/0609534. Bibcode:2006math......9534B. doi:10.1214/07-AAP456. Archived from the original on 2012-03-16. ^ Derivation is by recursion on decreasing numbers of players in the following round, see: Yao, E. "A Theoretical Study of Mafia Games" (pdf). p. 7. ^ Migdał, Piotr (2010). "A mathematical model of the Mafia game". arXiv:1009.1031 [math.PR]. ^ a b McCarthy, C (2009-04-24). "Why do young techies want to be werewolves?". CNET News. ^ Cross, D. (June 2005). "Mafia Party EXTRA TIPS". Vice Magazine. Archived from the original on 2008-11-20. ^ Gopnik, Adam (2006). Through the Children's Gate: A Home in New York. p. 245. ISBN 978-0-676-97827-8. the emotional authenticity of the alliances, the felt pleasure of trusting another, is startlingly, frighteningly real. You and George against the Mafia – but then the quick nightly shadow intrudes: What if George is the Mafia? Yet the proper suspicions, though they rise, rarely override these instant bonds. ^ Salen, K; Zimmerman, E. (October 2003). Rules of play: game design fundamentals (illustrated ed.). MIT Press. pp. 468–469. ISBN 978-0-262-24045-1. ^ Gopnik, Adam (2006). "Fourth Thanksgiving: Propensities". Through the Children's Gate: A Home in New York. pp. 242–253. ISBN 978-0-676-97827-8. ^ Cross, D. (June 2005). "Mafia Party THE SETUP". Vice Magazine. Archived from the original on 2008-11-20. ^ a b c d e f "Characters from the New Moon expansion set". 2010. Retrieved 2010-06-13. ^ "Various Mafia Roles: Third Party Roles: Arsonist & Firefighter". Archived from the original on 2007-02-20. ^ A typical Traitor-type role is the Possessed Special Character from "The LUPUS IN TABULA (2nd edition) rules". Archived from the original on 2005-12-24. ^ The Witch for example has this ability in Bezier's game "Ultimate WereWolf"
^ a b c "Characters". January 2010. Retrieved 2010-06-13. ^ The Psychiatrist can 'cure' the Serial Killer according to the Pub Game rules: "Serial Killer". . When 'the psychiatrist' is in play, the Serial Killer may be The Psychopath, as in: "Name: Psychiatrist (Various Mafia Roles: Third Party at MafiaScum.net)". Archived from the original on 2007-02-27. ^ For example, Ultimate Werewolf Masons[permanent dead link] recognize one another from the first night. ^ Spadaccini, S. (September 2005). The Big Book of Rules. Plume. ISBN 978-0-452-28644-3. ^ As in the Mafia Games setup described by group-games.com, requiring only mafiosi, police, a doctor, and the townspeople. Or, a simple version using only citizens, mafia, and detectives, as described in: Toone, M. (July 2009). Great Games!. MVT Games. p. 41. ISBN 978-0-9798345-5-4. The detectives now guess who they think might be one of the Mafia -no talking allowed, they simply point to one person. ^ "Wired Magazine Issue Selected articles from 03.10 > Werewolf > Werewolf: Extra Materials". Retrieved 2010-06-13. Optional rule: if the Lovers die and Cupid is still alive, Cupid chooses a new set of lovers. ^ The Cupid card in Bezier Game's Ultimate Werewolf, for example. ^ a b "Werewolf: Extra Materials". 2010-01-29. ^ "Character references". 2010-01-29. Retrieved 2010-06-14. ^ "Mafia variant: President". described by MafiaSpiel.de, for example. ^ A role introduced in Ted Alspach's 2010 Ultimate Werewolf: Classic Movie Monsters. ^ "Common Mafia Roles". Retrieved 2010-06-14. – The Silencer is typically aligned with them and knows their identities, but (in some variants) in unknown to them, not participating in mafia killings. ^ The Priest alone knows whether the dead were innocent in the World Boardgaming Championships game described by Bruno Wolff in "Werewolf rules". Retrieved 2007-11-19. ^ a b Toone, M. (July 2009). Great Games! : 175 Games & Activities for Families, Groups & Children. MVT Games. p. 42. ISBN 978-0-9798345-5-4. ^ "The Original Mafia Rules". 1999. Archived from the original on 1999-03-02. Retrieved 2010-06-15. Accusations may happen any number of times during the discussion...once in a while, someone should propose to have a Mafia Night. If the majority of the players who are still in the game agrees, the Night begins. ^ The random resolution is typical in academic models of Mafia. For example, see: Yao, E. (2008). "A Theoretical Study of Mafia Games". arXiv:0804.0071. ^ "Mafia and Werewolves". Note – This variant was performed with great success on November 12, 1998 – From the old Princeton variant rules. ^ 7-0-7, Jon Bennett "Mafia Advanced Rules" (PDF). Archived from the original (PDF) on 2011-08-10. Additional rules created by Jon Bennett, accepted in local Mafia circles. ^ "CISRA Puzzle Competition – Quantum Werewolf". Puzzle.cisra.com.au. 2008. Retrieved 2009-06-16. ^ "Train Mafia". Copenhagen Game Collective. 2009-09-27. Retrieved 2011-04-11. ^ "Invisible City: Rebels vs. Spies". Human-Computer Interaction Group, University of Patras, Greece. 2011. Archived from the original on 2012-06-27. Retrieved 2012-11-21. ^ "One Night Ultimate Werewolf | Board Game | BoardGameGeek". Retrieved 25 February 2014. ^ "Town of Salem". Retrieved 20 November 2018. ^ "Town of Salem: The Coven announcement". Retrieved 20 November 2018. ^ "MAFIA - XKCD Wiki". wiki.xkcd.com. Retrieved 2015-09-19. ^ "Epicmafia - Lobby". epicmafia.com. Retrieved 2015-09-19.